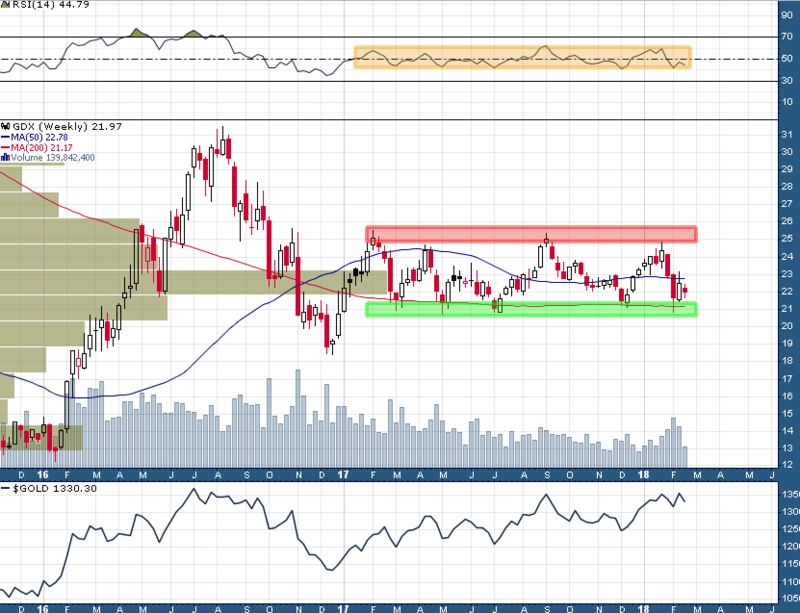 Gold Miners Setting Up For Potentially Explosive Moves | Energy and Gold Ltd.
GDX has been range-bound between ~$21 and ~$25.50 for the last year. GDX weekly RSI(14) has also been range-bound for the last year between 40 on the downside and 60 on the upside. Markets have a strong tendency to experience cycles (trending to oscillating, uptrending to downtrending etc. ), and I believe that the gold miners are on the verge of transitioning from an oscillating environment (mean reverting) to a trending environment (in which mean reversion will be much less common). In the last couple of weeks the GDX has tested the ~$21 support area for the 5th time in the last year. Price proceeded to bounce roughly 10% before running into major support/resistance near $23 and sinking back below $22. The current situation is different from the last four times that GDX had just tested the $21 support area; the difference is that the gold price has a $13__ in its first two digits, instead of a $12__. GDX is roughly 11.7% below its high from last month, whereas, gold is only about 2.5% below its January peak at $1365. What gives? Why have the gold miners been so weak even as the gold price has been relatively firm? The answer to this question is likely multi-faceted and could range from broader stock market weakness in the last month to the sector exiting a period of seasonal strength and entering a period of seasonal softness. We are also seeing gold miners continue to disappoint investors with earnings and production results (see ABX and PVG). There is no doubt that the gold mining sector is out of favor and it might take a significantly higher gold price AND better than expected production & cost performance from some of the senior producers to turn the frown on investors’ faces upside down. A decisive breakdown below $21 in GDX would signal that the gold miners are in a cyclical bear market amid tightening financial conditions (rising interest rates and a falling stock market etc.). A breakout above $25.50 in GDX could signal that the secular bull market is alive and well. This scenario would also likely result in much larger gains among junior gold mining shares as the animal spirits in the sector are reawakened. GDX would also then be well on its way to at least test the Summer 2016 highs. Be mindful that the precious metals sector is notoriously tricky and I can envision a scenario in which a failed breakdown below $21 in GDX (crushing sentiment and triggering stop loss selling) could lead to a violent upside move. In fact, such a scenario seems to be the most likely from my vantage point and would offer the best opportunities for tactical trading setups. Instead of trying to make bold forecasts of the future I prefer to be much more timid right now while awaiting additional information and higher probability trade setups. To find out how @Goldfinger is trading the precious metals sector as well as individual stocks and ETFs in real time sign up for the Trading Lab today!